What do all the different caricature products mean on the order page? This includes the head and the top of the body down to the level of the armpits. The draft is a line drawing that shows the outline of the final caricature. If you would like the person dressed in different clothing, or with glasses on or off or other minor variations this is usually included in the set price. The standard background is white or other plain color, however a graduated color as in the sample can also be requested at no additional cost. This product option includes all of the body. Different clothing can be specified. Props, if desired, are normally non-complex items - and may be something that a person is holding or leaning against. Typical prop items are a backpacks, a fishing rod or holding a fish, a sporting item, a small musical instrument, a hand tool, or even some lettering, etc. Backgrounds are either white, plain color or a simple graduated colour. NOTE: A car, aircraft motorbike if drawn in proportional size to the person, is classed as a person. If it is small (ie a (small) plane flying in the sky) it is then a prop. Want to go all out? Full body with background is the way to go. Here a couple of elements of the person can be included, various hobbies and interests to really support the pose. It could be a scene or a collection of items. Sometimes simple is best, too many will result in a cluttered look and detract from the main caricture. Often the full background caricature can tell a story, or twist a funny moment and really expand on it. The possibilities are endless. Black and white encompass the inclusions for each product above. Depending on the artist the BW can be a simple line drawing ideal for Tshirts, or a fully shaded and toned artwork. Pricing is identical for all artists. You can see pricing by visiting the order page for these currencies and making your selections. This will also allow you to explore our professional printing options (except EUR orders). Yes you can. We will transact orders in any currency. If you wish to purchase in our stanbdard US$ or Aust$ or EURO visit your selected artists page or their sample page and select your currency and complete the order process. For all other currencies, please Email Matt and we will make special arrangements for your payment. Credit card - Mastercard, Diners, Visa, JCB and American Express. This can be via the online payment system or if you prefer you can ring us on +61 409 349 752 (where the + is replaced by the digits you dial from your country to call overseas). Our artists each have their own style - caricatures are the artist's interpretation of your face - they are not portraits. As such their finished work is an interpretation of the image/s supplied and can include exaggerations and other expressive manipulations and colouring. We provide many samples of each artist's work to assist you in your selection. Caricature A representation, in which the subject's distinctive features or peculiarities are deliberately exaggerated to produce a comic or grotesque effect. This means a caricature is not a portrait, and under some circumstances may have a limited similarity to the original subject. Basically it means your nose may not be proportional because it has been exaggerated, or a forehead might be extra high etc. Certain elements of the face or body may adopt different shapes (like smiles) or colour tonings - this is what caricaturing is all about. Please note that each artist has his own style. This is clearly shown on each artist's sample page. Word Origin Derived from Italian caricare, "to load, burden, or exaggerate". Therefore, to ensure your satisfaction, please make sure you view the samples pages of each of the artists to find a style that suits you. The style you choose is what you get! The Caricature King's artists work from a photo/s you supply as part of the ordering process. Most artists sketch the work and then ink by hand or digitally. While Zalo completes all work by hand, all others others complete the work using digital airbrushing. 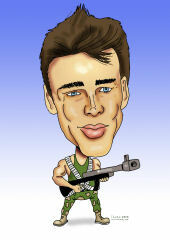 No matter the method of production the basic caricature product is supplied to you via email. We also provide poster, canvas and framed print options for USA and Australia customers. Can I get original paper-based artwork? Except for one of our artists, caricatures are drawn and digitally air brushed, so the original is what arrives in the email. As our artists are located around the world, we have found that generally post/courier shipment is not feasible and generally very expensive. If you MUST have the original artwork, please contact us and we can discuss. Alternatively, please see the Poster print, Canvas print and Print and Frame options we provide on each artist's order section at the lower part of the artist's pages for both USA and Australia. How long till I can expect my caricature to arrive? Most caricatures are delivered within 6-12 working days of receipt of your picture/s by the artist, sometimes sooner. The expected timeframe is shown on each artists sample page. On occasions, due to public holidays, weekends or periods of high demand etc this time-frame may be a little more. If you have a specific deadline, please inform us of this and we will advise if the artist will be able to meet it, and if there might be an additional charge if urgent. Can I supply an image with more than one person featured? Yes you can. Please be very clear about the person/people in the image you want included. If you have an image which includes people NOT to be included, that is fine, we can crop it prior to supplying to artist - just be sure to clearly identify who is to be retained. What about several separate images and having them all included in the one caricature drawing? Yes we can do this! Just provide a guide as to who you want where, sitting, standing etc. We also need to know relevant heights of people if they are not in the same image. Please note it is sometimes hard to the artist to get peoples skin and hair colourations correct if the images show widely different exposures. You must select the number of people in the final caricature during the ordering process. Discounts apply for two or more people in the one caricature (see above), or in separate caricatures. Each person in the photo is priced as a new caricature, even though they may be in the same finished image. What is preferred for my photos, a close up of a face or a whole body? If the caricature is of a head and shoulders, then one or two good clear head and shoulders pictures are fine. If a full body caricature, another picture showing the full body is great. If it does not show the face clearly, then a photo of the person's head will also be needed. If not obvious, please also made mention in the email the colour of people's eyes. For more information, please see this page on photo suitability. Remember - a poor source image may result in a less that optimum output!! What image size can I supply? Images must not be too small. The artist cannot work well from anything less than an image that is clear and fills at least half your computer screen. Please try to resize images so the file size is no greater than 1mb. If your photos are too big, resize them, perhaps using software that came with your digital camera. What other details are needed? For full body in scene, as much information as is relevant to give the artist a clear idea of inclusions. A good word picture can be great. If you can, please supply images of specific objects, as sometimes the artist may not live in your country and local terms may not be clear. For full body with props, please mention preferred stance, and what objects should be help and in which hand. You can also nominate clothing changes. If not evident in the photo, mention hair and eye color. Most orders include a draft stage which provides an accurate representations of the final caricature. This provides good opportunity to have input into the creative process and request changes at this time. Other artists provide a final proof, where changes can still be made. If on the delivery of the final caricature, you still have concerns, please contact us and we will assess what changes can be made. Many modifications can be accommodated, but significant work will require a redraw and may incur additional cost. If you intend to use caricatures for commercial use, please advise us as part of your initial enquiry. 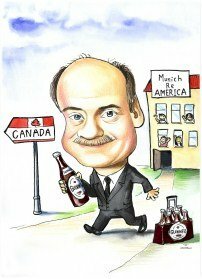 Caricature King retains copyright over all images, however, this is NOT restrictive. With the exception of commercial use, you are able to use and reprint the image as you wish for private purposes. We supply a statement for your printer giving printing permission. For commercial use full copyright release is by negotiation. Caricature King also reserves the right to use versions of any caricature on the artist's sample pages etc. If you specifically do not wish for your caricature to be used as a sample, just let us know. Can I make money promoting your service? Yes you can! - Please visit our Affiliate page for details. If you have any feedback about the usability of this site, or need a different style etc, please visit our contact us page and we will make site changes or provide assistance as best we can.